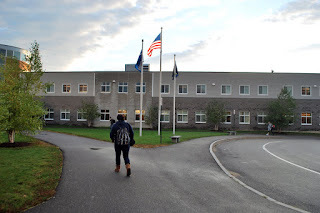 A recent incident involving two of our students has prompted some questions as to how Sanborn Regional High School addresses disciplinary issues, especially ones that involve violence and impact the overall safety of all of our students. As we approach the conclusion of the first semester, we will be reviewing students’ proficiency on course-level competencies to award credit. This year, in order for students to successfully earn credit in a course, he or she must demonstrate proficiency on each individual course competency by obtaining a 65% or higher average for that competency as well as earn an overall passing grade for the course of a 65% or higher. It is possible for a student to earn an overall course grade greater than a 65 but still earn less than a passing grade on an individual competency. In this case, a student would not earn credit for the course until the failed competency grade was remediated. 1. This is a short week. We have NO SCHOOL this Friday. We will be on holiday break and school will resume on Monday, January 2, 2012. 2. I have attached the schedule for final/midterm assessments, which will be held on January 12 and 13. Quarter 2 ends January 13th. 3. SAVE THE DATE for our next open house, which will be held on January 23 from 4:30-8:00pm. 2. Speaking of parent volunteers ... last week a group of parents officially formed the SRHS PTO. You will be hearing more from this group in the coming weeks as they prepare a membership drive. 3. Dr. Blake is hosting a community forum on keeping our kids safe next Wednesday, December 14, at 7pm in the cafeteria. Please review the attached letter for more information.